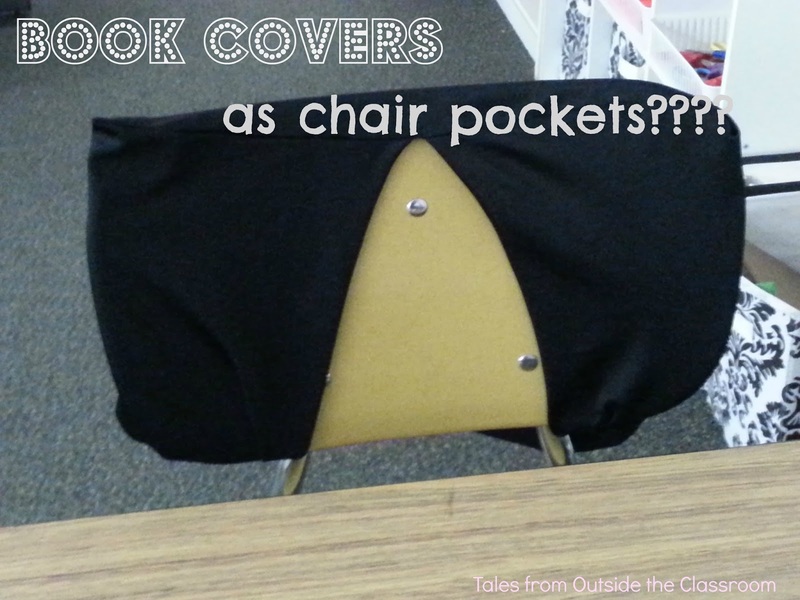 If you’re a Pinterest stalker like me, you’ve probably seen pins from a variety of places showing the marvelous idea of using cheap, stretchable book covers as chair pockets. I first saw it from a colleague last year and I loved the idea. I know I’ve also seen it from Cara at The First Grade Parade, though I can’t say with any certainty who the idea originally came from. As I set up my classroom this year, I bought 12 of them for the seats around my two group tables. I wanted some place to store dry erase boards, markers, and erasers. It was a spectacular sight in August- complete with wonky corners and all. Enter the day, you know the second week of school, when we started using the table for group work. It also happened to be the day that I lost my sanity. Yes, the picture is quite blurry. It wasn’t intentional, but I think it’s a nice touch, don’t you? So, as soon as students sat down, and then got right back up to sit on their knees, you know, because, it’s physically impossible for 8 year olds to sit in their seats for 20 minutes at a time without going up and down and left and right and up and down some more. Well, maybe it’s my chairs. Maybe it’s my kids. Or, maybe it’s my luck since I seem to have none in this thing called life. As soon as they sit on their knees, and their feet go through below the seatback and knock into the board, the whole thing starts sliding off. And, pretty soon, this is what my floor looks like times 6. So when we need them, instead of taking a quick second to pass them out, I take a quick second to ask them to pick them up off the floors. And then, of course, someone tips over sideways outside of their chairs. Because, you know, 8 year olds have no center of gravity. It must be something physiological that happens at about year 9. Or 14. Or something other than 8. And then, I ask them to fix it before they leave. Of course I want it ready for the next group. And, also of course, I’ve shown them on more than one occasion how to correctly put it back on. But, that visual perceptual piece must also be missing until the age of 14 or whatever the magic number is because every stinkin ever loving time, I turn and see this. And the board and items are on the floor, or the table, or somewhere obviously scattered. Bless their hearts, they tried. They did. It’s the way you use a book cover, ya know. So, I’m almost 4 months into these DIY chair pocket things and I’m now bald from all the hair pulling and wondering what the magical answer is. Is it my chair style? Is it my kids? Is it that my kids don’t have the visual perceptual pieces or the center of gravity pieces to make this work? Help me find my sanity! Please! This cracks me up! Thanks for the laugh….only laughing because it sounds like my life! I have NOT tried this…but I'm predicting it to be the same outcome. When you have such great hope in something, you just don't want to give up, but…it might be time to! 🙂 Thanks again for the laugh! I tried this with 3rd graders and had the same results, although a many could figure out how to put them back on. Cute idea but it just did not work. I got rid of them. I thought about doing this, and then I thought about the fabric…not sure if yours are the "stretchy" type but honestly I just knew that the combination of stretchy lycra and a hard back chair would not mix. I know what happens with my yoga pants! 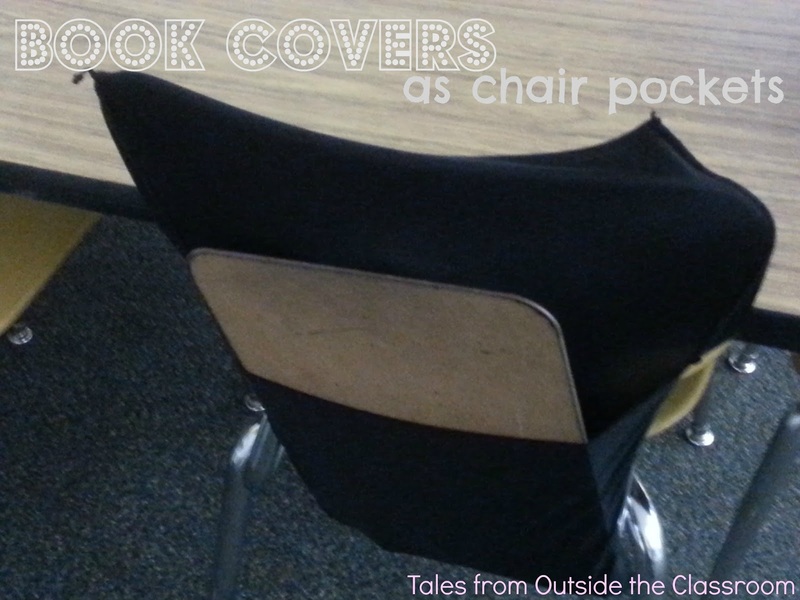 I think those chair back covers might work IF they are made for a chair, but the book covers are made for books…Let me know if you ever find out a workable answer because, I am a pinterest fiend, but I won't leap until I find a good solution. Yikes! Thanks for sharing your hysterical experience. Too funny-actually I had a great experience with book covers. Looking at your pictures makes me think yours were too big for the chairs. I teach first grade and used the small bookcovers . 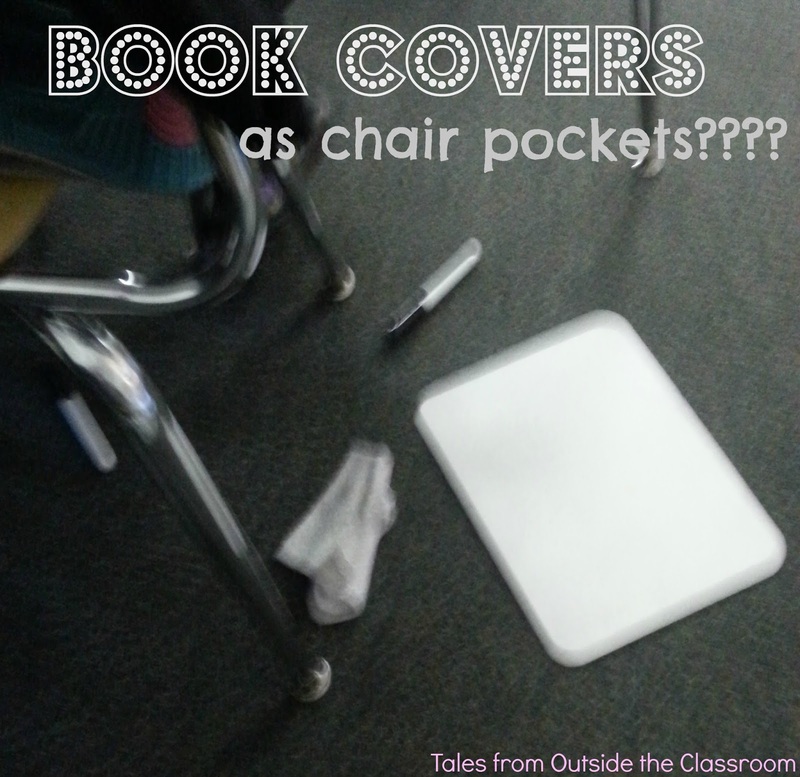 Every student had one on the back of their chair and we used them instead of book boxes. The only time I had a problem was when a child put a very tall book in it, the cover would flip and all the books would fall out. We fixed that problem by having the kids flip their tall books horizontally. I got he book covers at Target for 10 cents each during back to school sales so they were a bargain. They also worked great at the end of the year because we used them to wrap up all of the children's goodies in their desk that they were taking home. Anyway, I can totally relate to how frustrating it would be to have them keep falling off-sorry it didn't work for you!!!! I use them in my classroom as well. 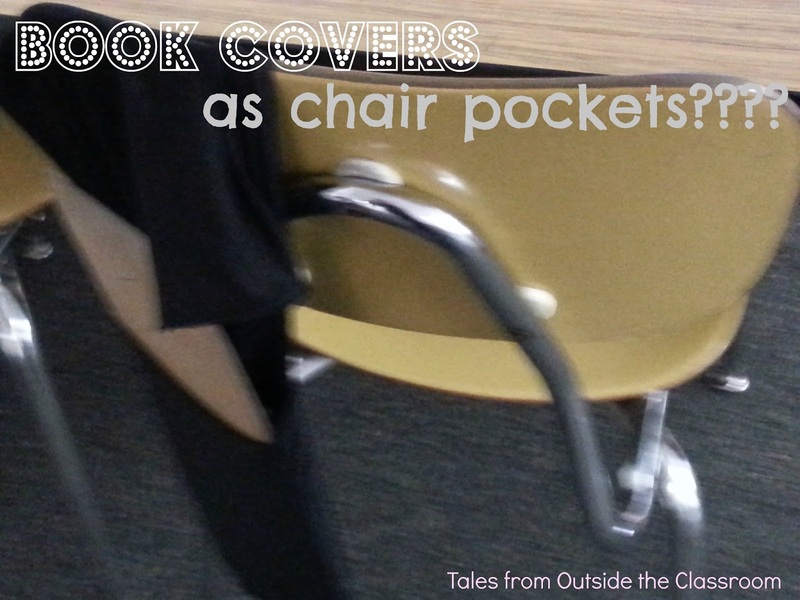 I have found that the ones with bar at the bottom of the chair work best because then the books in the cover have something to rest instead of just hanging mid-air. My squirrels always have their stuff on the floor (about 3 or 4) but the rest of the kiddos are able to keep the stuff in and they don't fall out. One thing I have noticed is that it works best when the items are small like composition book, leveled readers, flash cards etc. We tried putting clipboards in one time and it was huge fail.